This month we have been running with the theme of cooking for your pets and we have had many people email us wanting to tell us about the different meals that they like to make. This gave us the idea to start a section on our website just for pet recipes so our customers can share their different recipes with each other and to get ideas to create new dishes. So now we would like to invite you all to send in your favourite pet recipes to us at info@vetshopaustralia.com.au, and we will have Dr Mark check them over for their nutritional value as a meal for pets and then put them up on our site. Also, if you have any photos of the prepared meal to go along with the recipe then we would love to see them too! Here are a two recipes to get you started. Combine all ingredients and serve at room temperature. Stir together and serve at room temperature. 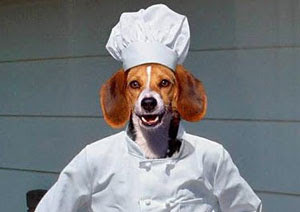 Don't forget to vote in our latest community blog poll 'Do you cook for your pet?' located on the right side of the page. Ahhh my favourite topic! Yes I am a firm believer in cooking for your pet - however, I suspect I am about to write a thesis about the subject on this blog! Where do I start?! Okay, firstly, before you make food for your cat or dog (I will only be discussing dogs and cats here), you do need to consult with a vet who has a pet nutrition background (not all of them do - just like a doctor doesn't necessarily have nutrition knowledge, it is a specialised study done by a nutritionist!) to ensure that the meal is 'complete and balanced' - see AAFCO's standards. Also, what may be good for one pet, may not be suitable for another. Sick pets in particular need a more specialised diet - so be VERY careful when feeding them a home cooked diet and ensure you have the right amount of proteins, carbs, fats etc. Unlike with human food, pet food is highly complicated and you can't just simply feed them any quantity of ingredients (just like on a human product's label - knowing the nutritional content of the entire meal is very important - this is hard to do unless you have a spare few hundred dollars lying around to spend on having the food tested in a lab!). The occasional meal is the exception. But if you are going to feed your pet a home-cooked meal every day, seek professional advice (ask to see the vet's nutritional qualifications - if he/she says they dont' need one, they're lying as nutrition is covered only very briefly in a vet's course - again, they have to specialise in it!). As for feeding vegetarian/vegan foods - be SUPER careful here! No matter what anyone tells you about their vegetarian or vegan food, cats in particular cannot live properly on this diet - they are carnivores. In some ways I think it is animal cruelty to feed your cat a vegetarian or vegan meal as just because you like it, doesn't mean your cat will (of course if they are hungry enough, they will eat it otherwise they starve!). Their natural make-up is that of a carnivore and a hunter, by taking out what comes naturally to them is like taking a human out of their normal life and forcing them to do otherwise. Dogs can live on a vegetarian diet (vegan is going a bit far though! ), as they are omnivores but again, will they be happy? It is also a more highly complex recipe to ensure that a dog get all his nutrients from a plant base. And you need to know what you're doing. Dogs love meat though - just fill a bowl with meat and veges and watch how fast the meat goes while the vegs get nuzzled out of the way - if that isn't a sign, then I don't know what is, people! So again, you really have to think about what is best for them and what they will enjoy most - they are not you, so don't feed them what you eat! How do I know all this? I am a pet nutritionist who cooks for her dogs and cats and have spend many years researching pet nutrition. I hope this has been of some value to anyone who shares the same passion as I do about feeding our pets a complete and balanced home cooked meal. I wish you all the best of luck in researching your pet food recipes, get in contact with your local pet nutritionist and go for it in the kitchen! Your dog and cat will love you for it!